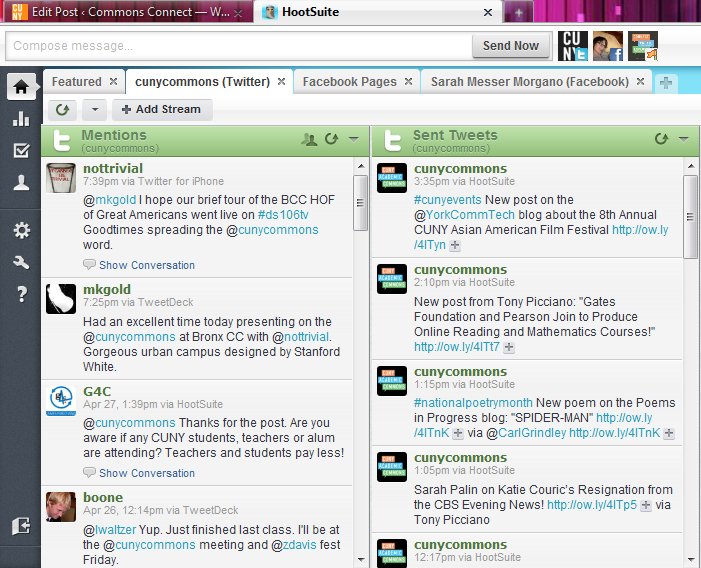 Follow the @cunycommons on Twitter and Facebook! With more and more CUNY faculty and staff connecting every which way on the world-wide-web, the Commons is still committed “to grow in a flexible manner” by making sure that conversations aren’t happening in silos. Part of doing that is by posting up dates and sharing resources across multiple social networking sites. And, being the total nerdbot that I am, I happily agreed to maintain our social media presence on both Twitter and Facebook. Every day the Commons brings me news of a new event, resource, or CFP, and I love being able to share that with as many people as possible. For example, since the CUNY Instructional Design group is public I was able view the group update from Chandra Hanke (@chanke) with details about the CUNY Instructional Design Council’s first meeting. I then posted that information on both Facebook and Twitter linking directly to the group update in an effort to help spread the word about their meeting. The CUNY Instructional Design group was only created about a month ago and it’s great to see so many members on the Commons, who might not necessarily be instructional designers on their campus, take an interest and join this group (there are currently 25 members). As a shout out to our growing Math Matters group, I’d like to share some numbers with everyone. To date, we have nearly 100 Facebook fans and over 400 followers on Twitter. Clearly, Twitter is the big winner among CUNY grad students, faculty, and staff. I think this is because Facebook and Twitter are used in different ways. Facebook is a way to connect to friends and family and Twitter is a way to find people and connect to content. Also, I’d say that a decent amount of @cunycommons Twitter followers span the national academic community — a trend I haven’t found in Facebook. Since many people use Twitter to stream live from conferences using themed hashtags, it’s easier for academics to connect with people and ideas from across the globe. And, with so many great ideas and resources bouncing around the Commons, it’s nice to be able to showcase what we are up to! Speaking of showcasing, Scott Voth created a new page on the Commons News blog called “Commons Buzz”, which highlights recent press coverage of the Commons. If you have a few minutes I would highly recommend checking it out!! One of the advantages of posting roughly 140-character summaries on new happenings across the Commons is that I’m able to keep up on all-things-CUNY. That being said, if you’re having difficulty looking for something you saw on the Commons last week, last month – hit me up! I have to admit that before I began tweeting regularly for the Commons, I was a total Facebook fangirl and didn’t log-in to my Twitter account regularly. In fact, my second blog post on the Commons touched on my (then) use of Facebook and Twitter. Anyway, after reading different blog posts on the Commons about Twitter and coming across some great #ePortfolio resources by using #hashtags, I began to see the value among academics. Also, after reading the NYTimes article, “Twitter Puts Spotlight on Secret F.B.I. 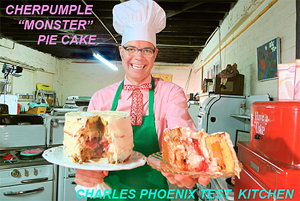 subpoenas,” Twitter scored some bonus points (and Facebook lost some). Needless to say I have been spending more time on Twitter and less on Facebook. Recently, I’ve started to use Hootsuite to manage the various social networking accounts that I oversee. What I like about it (besides for the fact that it’s free!) 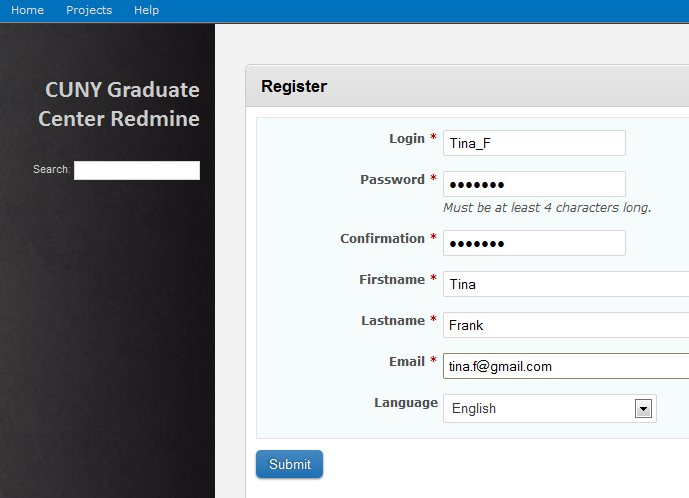 is that I can easily schedule updates without having to log-in to multiple websites or applications. Most definitely a time saver! One of my long term Twitter goals is to build a robust “follow list” of CUNY twitterers (both inside and outside the Commons). I started by building off the initial @mkgold/cuny list (thanks @admin!) 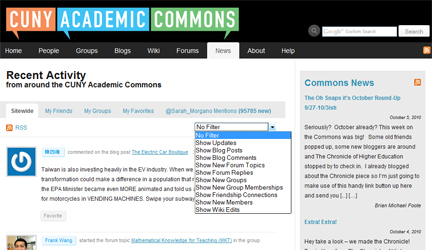 by going through members profiles on the Commons to see if they had a Twitter handle posted on the profile page. I was also able to follow a few new CUNYites through their networks; and as of today we have 202 members on the list! Lastly, as a follow up to my original shout out to the Math Matters group, I would like to extend that shout out to all CUNYites (both inside and outside the Commons) and invite you to not only follow us on Twitter and Facebook, but also follow each other. You can start by browsing the @cunycommons/cuny follow list! Have questions or suggestions? Please post in a comment below or reach out to me via email at smorgano01001 (at) gmail (dot) com. Hello CUNYs and happy MLK day! While most of you are enjoying some well deserved time off to relax and prepare for the upcoming semester, some of you have been quite busy on the Commons (which, of course, I love because it gives me something to write about!) OK, on to my favorites of the week… While major media outlets have been focusing on the vitriol of politics and “the man with the golden voice”, this week I’d like to focus on educational technology related postings, updates, and threads on the Commons. My first favorite of 2011 is the latest post from Alevtina Verovetskaya’s Reading Log. The article also highlights the impact of applied research at CUNY. For instance, Maura Smale and Mariana Regaldo are in the middle of a three year study on the scholarly habits of students at six CUNY campuses and, as a result of their initial findings, have already reconfigured the study areas at City Tech’s library to support additional privacy for students. What I really liked about this article was the overall theme of sharing and collaboration which, according to Cirasella, “are what librarians are all about”. 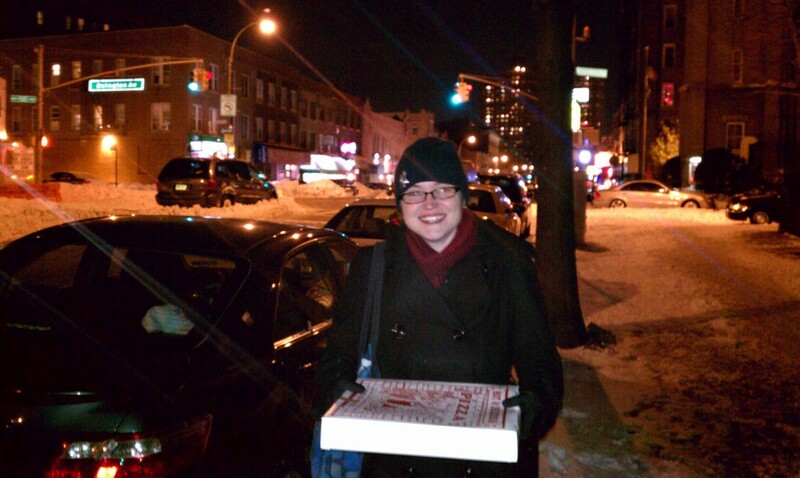 While we’re on the topic of libarians, I wanted to share an update posted in the CUNY Games Network by City Tech’s librarian Maura Smale @msmale. Hosted by Christopher Jason Smith and the CUNY Games Network Steering Committee, this full-day tabletop games event will be held at LaGuardia Community College on Friday, January 21st and is open to all CUNYs. While this very first tabletop game event will primarily feature mainstream games such as Battlestar Galactica, Magic the Gathering, and Diplomacy, Maura notes that a few educational games are likely to be thrown into the mix. Those who attend will also be given a short tour of the ”Games Library” created at LaGuardia to help CUNY faculty examine games for research purposes. If you’d like to stop by for a couple of hours or intend to particpate throughout the day, please try to email cunygamesadmin@googlegroups.com with your name to help the CUNY Games Steering Committee keep a headcount. Speaking of committees, according to an update posted by Adam Wandt @awandt on the Academic Technology Research and Development Group (a new subcommittee of the CUNY Committee on Academic Technology), Skunkworks will hold their first meeting on January 20th at 10am via Elluminate. Established by CUNY faculty and staff, its mission is to research, test, and recommend new technologies from the perspective of classroom needs and pedagogical effectiveness. I signed up as a volunteer shortly after Chandra Hanke, Phil Pecorino, and Adam Wandt presented “CUNY CAT Academic Technology Research and Development Group: The ‘Skunkworks'” at the 9th annual CUNY IT Conference. I’m really excited about testing new technologies and sharing our results with the CUNY community and cannot wait to use Elluminate for the first time at our first meeting! My next favorite this week stays with the theme of “collaboration”. 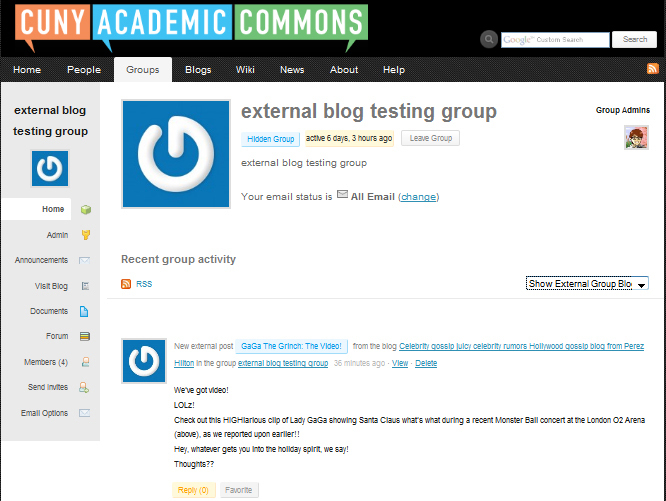 Daniel Bachhuber @danielbachhuber posted an update that he is searching for other CUNYs to work on WordPress as a learning management system. Most of you probably already know my thoughts on Blackboard, so I think it’s really important for CUNY to explore additional options for learning management systems. Since many CUNY students are already familiar with WordPress through course blogs or blogs that they’ve created on their own, it seems that WordPress would be a viable platform to consider as an LMS. If you’re interested in exploring the pros and cons of WordPress as an LMS, I’m sure Daniel would be happy to hear from you! Speaking of WordPress, my last favorite this week is a forum thread from the WordPress HELP!!! group. Well that’s it for this week, but please keep those updates, posts, and forum threads coming!